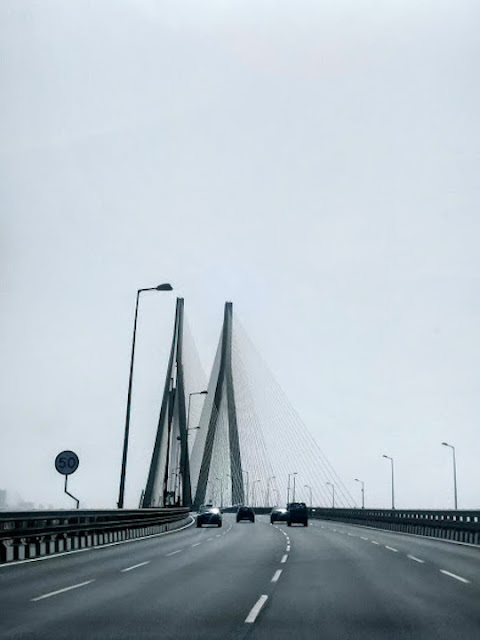 I have been travelling for a few years now, more so in recent past. Infact, the love for travel began back in junior school. Luckily my parents let me go on every single trip, be it day trips or longer ones to new destinations. Even though they weren't big on travel, I got to explore the country-- Yayy for me! And over the years, I found joy in travelling alone. Initially it was because friends were busy and couldn't take time off but over time it has become something that is all mine. I infact even hesitate to tell people am travelling for fear that they will want to come along or latch on.. Maybe I am just being cautious, because I firmly believe that if you can travel with someone, then that relationship is set for life- be it a friend or otherwise. And the one big takeaway for me with the whole travelling alone is that I have learnt so many lessons, discovered so many things not just about myself but about how to travel smart and wise, considering am into budget backpack travel and not the lavish kind. Few weeks back, I was working out of a cafe, rather editing pictures from a recent trip when a friend pinged me on chat. We hadn't spoken in a few months, and it was a pleasant surprise to hear from him. We started chatting and here is how the conversation went.. He - Hey, how are you doing? He - Ah well, I do think about you woman, just that life happens and then work happens, etc etc..
He- Nah, never.. am happy you are doing what you Love.. back in Chennai? Me- yes, been 3 days since I got back. He - So where all did you go this time?Spill the beans. Me - I was exploring in and around Gujarat this time.. Familiar places and few new ones as well. 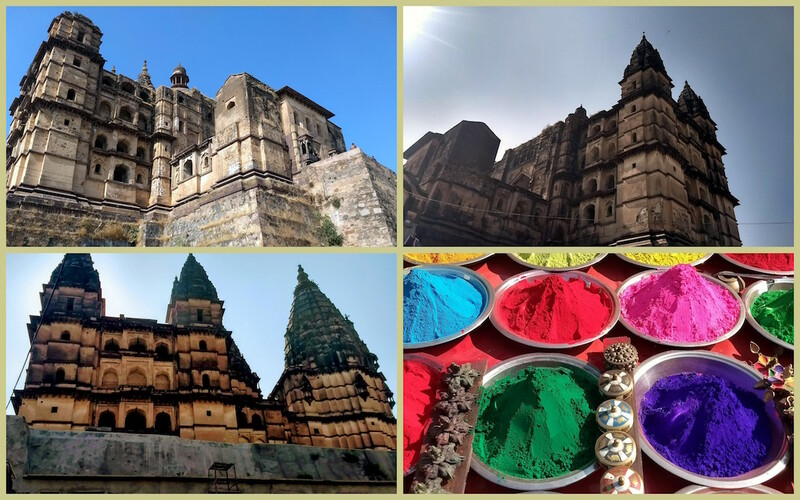 We started with Ahmedabad, then explored the regions around- Adalaj, Patan & Modera before moving ahead towards Bhuj and Rann of Kutch. It was a fun packed road trip alright. Also combined plenty of textile based village/NGO visits. Me - Well, this one was actually a reccee, which means we were checking out the region, the accommodation etc so we can put together trips and bring people. But yes, when we do that we will charge them a fee plus what is called GST. 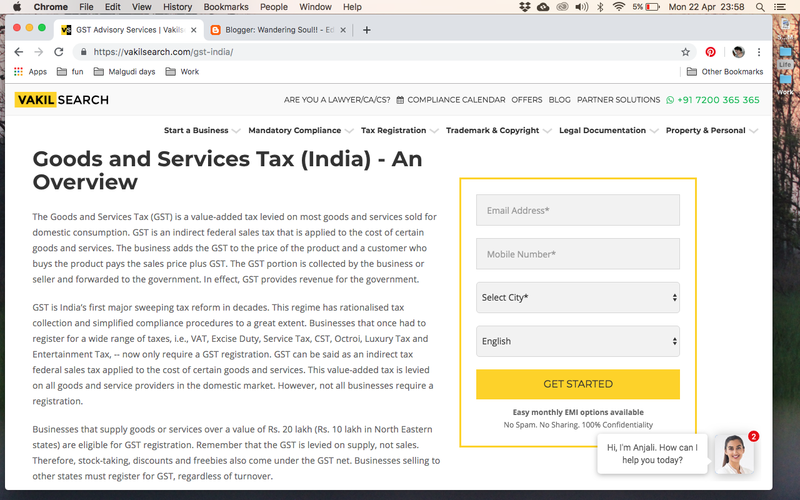 He- Wait, what is this GST? 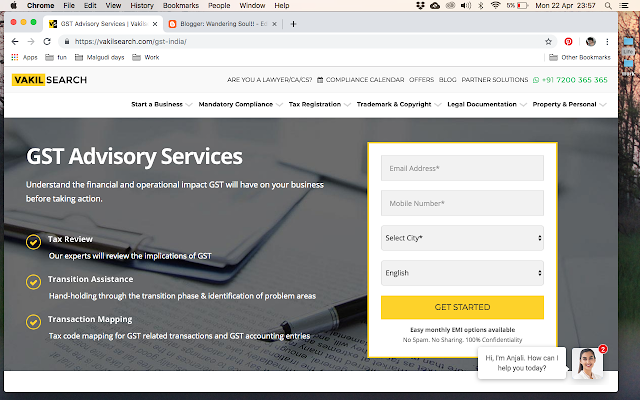 He - So, you pay GST on pretty much everything..
Me - Yep and you gotta file GST returns periodically as well. He - Hmmm, and what about food? does GST apply there as well? 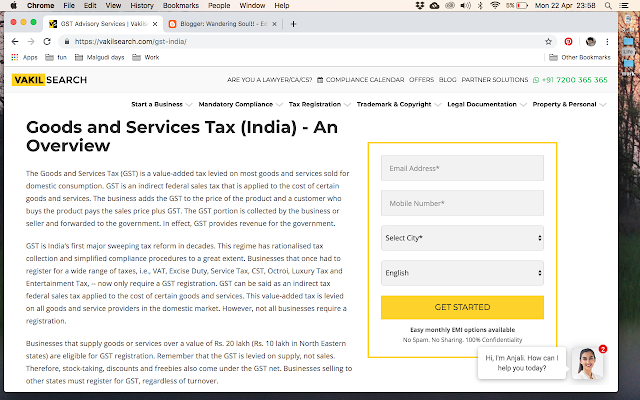 Me - yep, in that you will see two components at the bottom- CGST and SGST- one goes to the center and other to the state, the total GST percentage is divided up equally between the two.. And on top of this, some places add Service charge[10%] as well- which is basically tips. He - oooh. okok.... Wow, so much has changed since my last trip home... What about flight and train tickets? how do they work these days? He - Shuddup monkey.. I mean how expensive are they these days? Me - ahh that.. well, if you book ahead they are cheaper... Under the new taxation laws, the tax on the economy class is 5% while business class is 12% when it comes to flights ... For trains, GST is applicable to all categories of tickets at 5%.. So, how do I find out about GST returns filing? Me - That is for businesses, but then you can check the site I mentioned earlier. It is quite indepth and easy to follow. Infact, they even do the needful for you, all you gotta do is provide necessary information and documents. He - Wow, good to know... Ok, this is enough for today, more later.. head is swimming with info... What were you upto when I buzzed? Me - Cool.. Was editing pictures from the recent trip.. I had heard of the Kala Ghoda Festival in Mumbai few years back and since then been wanting to visit the city around the time. But well, something or the other came in the way until this year.. 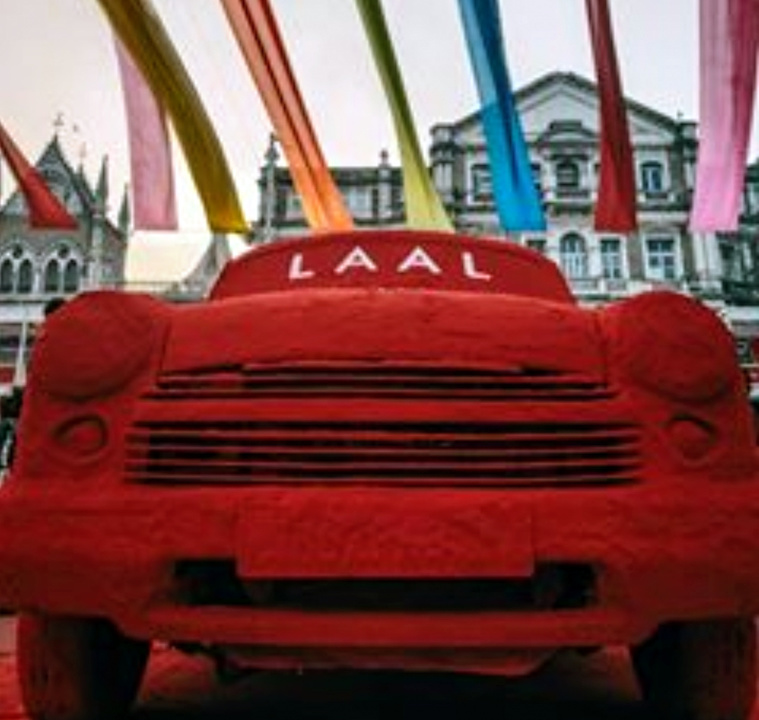 I planned a short quick trip to Mumbai, just before the festival drew to an end. Was quite excited and so was my bestie who lives in Mumbai.. I landed in Mumbai Thursday morning and Friday afternoon we decided to visit the Kala Ghoda festival. Pick up friend's son from his class and off we went.. The ride from Goregaon to Fort area took almost an hour and a half, not including the half hour break we took at Pizza by the bay [lovely place by the way, but that is reserved for another post] ..
Was fascinating to walk around, one section was for NGO stalls and the other side was for the general vendors. 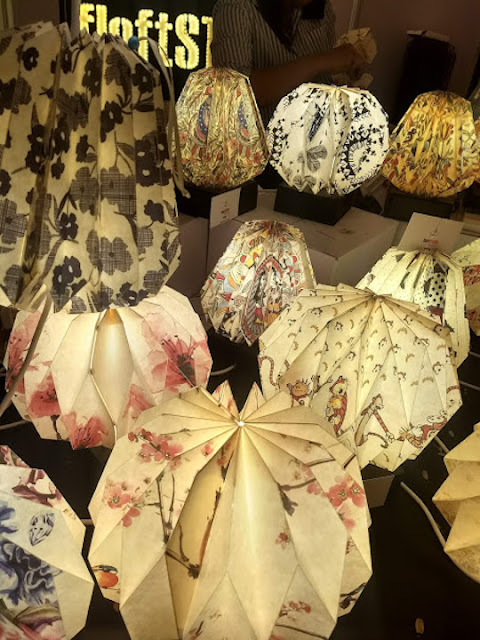 The stalls change after the 1st 4 days, and then in come new ones.. and then there are talks, workshops that happen across the space, in different venues. 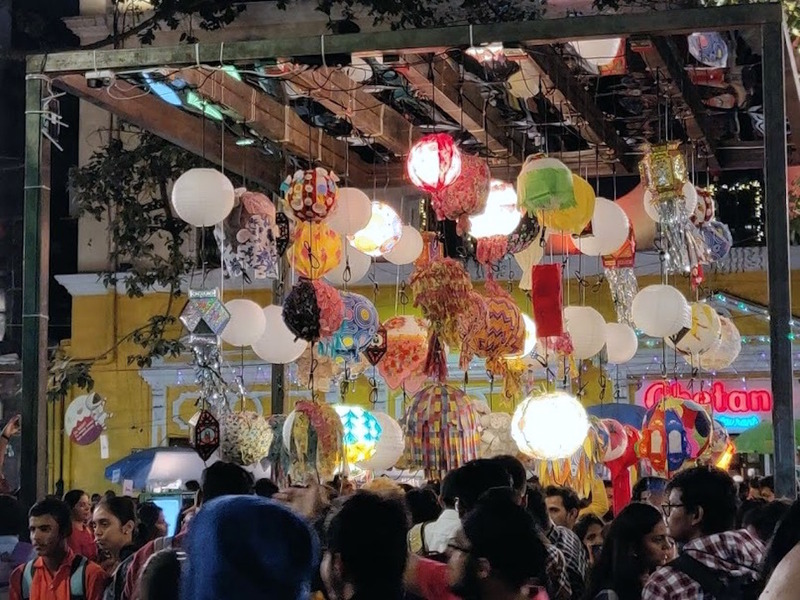 As we wandered about, I did meet my friends, chit chatted a little bit before moving on to check out more stalls. Another lady I met , or rather kicked off a conversation with was Uma, who is from chennai and works at the Chinmaya IAS Academy. I initiated a conversation only because I heard her speaking in tamil ... hehe.. It is quite a thing! By the time we decided we were done exploring the place, and paid heed to the hunger pangs, it was 9pm.. We had spent close to 7 hours there, the longest I have ever spent at any festival.. :-) Did pick up a few things from the stalls- cloth bag to buy vegetables [it had 6 smaller pockets inside], jewellery[ friend gifted me 2 neckpieces],some herbs, freshner packets for the cupboard and so on.. I also gave my friend some time alone and helped her son decorate a light [we were given a paper light, got to use glue gun and fabrics/sheets/etc to decorate it- so much fun.. this whole installation was an initiative managed by the Goethe-Institut year on year.] 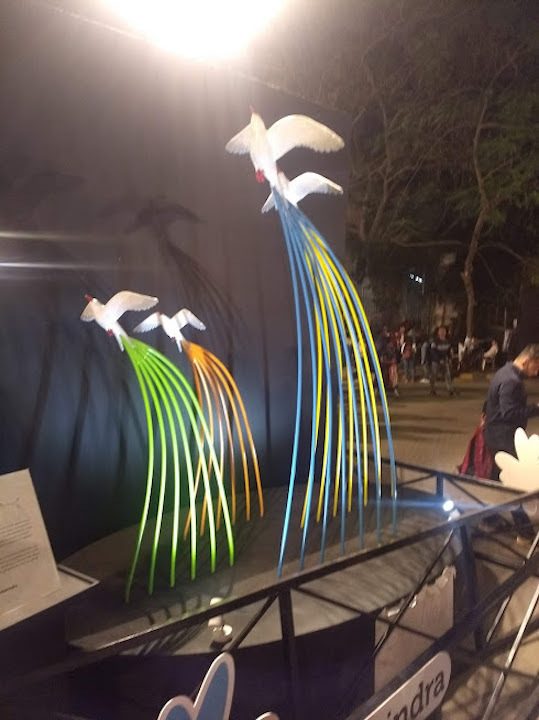 Apart from this, there was a cool set of lights outside the Goethe-Institut that looked like the globe & a few displays within the campus based on science..
Phew, what a day it had been!! The next morning, we were up, ready and done with breakfast by 8am, the car was delivered and we hit the road by 9am. I remembered to pack my powerbank and cable as well. 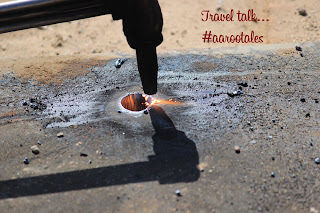 First up, we were off on the highway towards Omkareshwar [ which was about 78kms away]. Upon reaching the town, we used google maps to take us towards the temple. We were stopped at what looked like a gate, asked to pay Rs20 for entry. And then further ahead, a guy directed us to a rough spot to park the car, and then showed us to a hut of sorts asking for Rs50 for parking. We told him we would pay when leaving! There was a small cluster of temples, including a Shiva temple near the parking lot. Took off our shoes and did a quick walk around, before heading down the stairs towards the Narmada river. Both sides of the steps flanked with shops selling everything from things to offer God to toys, jewellery and more. At the bottom of the stairs, was the row of boats waiting for customers. One guy managed to convince us to hire him, [after much bargaining, we agreed to pay him Rs700, he quoted Rs1200- we got a quick ride towards the dam, were shown a spot saying"triveni sangamam of Rivers Cauvery, Narmada and Tapi", a Vishnu temple and finally the mail Omkareshwar temple, which is located atop the hill. There was a bit of acrobats involved in getting off the boat, and I was glad I hadnt carried my DSLR. We had to jump into another boat and then walk down the length of that one before hopping out onto the steps.. Phew.. made it alive! And then once again as we made our way up the steps, men who looked like priests came over to convince us to hire them to show us to the main deity. One man showed us a ticket and said even though it was priced at Rs350, he would take us up & inside for Rs250. We dint buy his crap, but just played along. As expected as we got close to the main shrine he started with the "well, you need to go there and get a ticket for x amount for abhishekam and archanai, and then pay me Rs300 for taking you inside.. la la la..." we dint even listen to him, cos he hadnt made things any easier, we told him to bugger off and stood in line with the rest of the crowd. In 20mins, we had reached the main shrine, said our prayers and were out. And then peacefully we made our way back down the hill towards the boats. Had to wait a few minutes for our ride to take us back! Well, it was one hellova experience alright.. Even though I was sceptical about the boat ride etc, it was well worth it... Up the flight of steps and back towards the car we went. It was nearly 1pm, hunger pangs were starting to chime in. 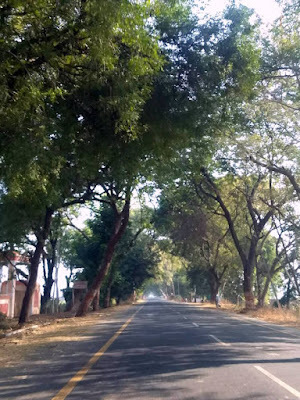 Deciding to take a break before hitting Maheswar [which is 66kms from Omkareshwar], we drove towards the MP Tourism property- Narmada Retreat... 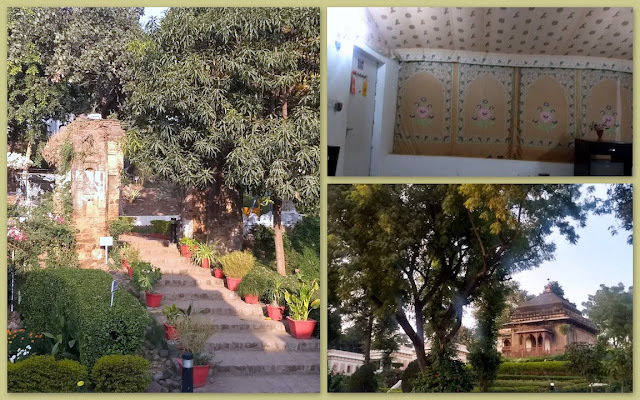 The property had a similar layout to the Betwa Retreat in Orchha, located right on the banks of river Narmada with rooms/cottages scattered across the vast space. There was a pool near the restaurant and we could hear kids screaming about. We settled in, ordered lunch and relaxed a bit. 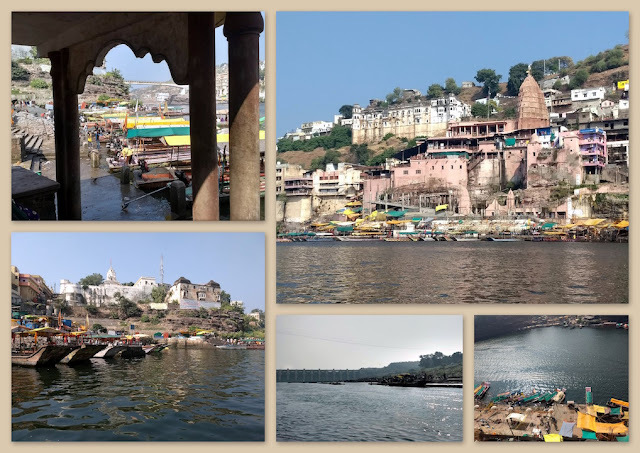 Apart from the Ahilya Holkar Fort, Maheshwar is also the centre of handloom weaving [thanks to Ahilya Holkar] going back to the 5th century, Maheshwar has been producing the exquisite Maheshwari saris and fabric. 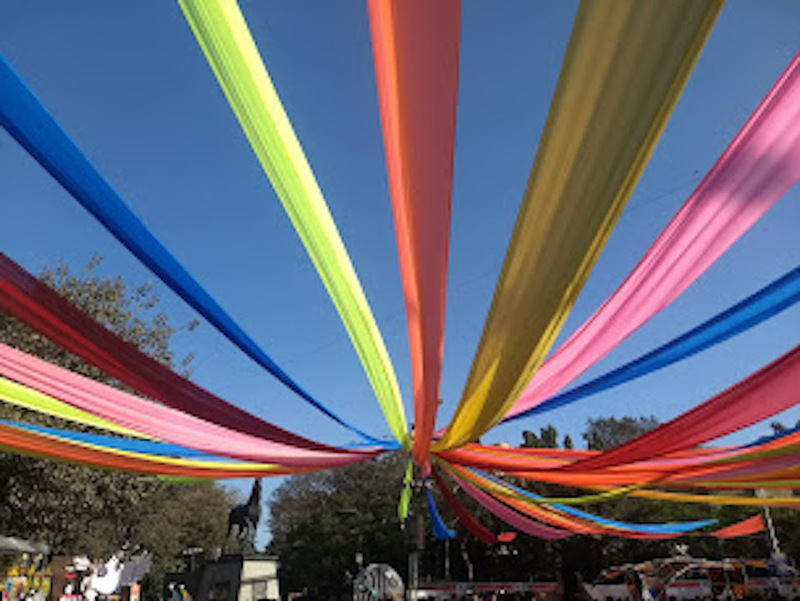 The town also holds the distinction of being the capital of Rajmata Ahilya Devi Holkar’s empire during the 18th century... We spotted quite a few places with the weavers board, and some shops as well. 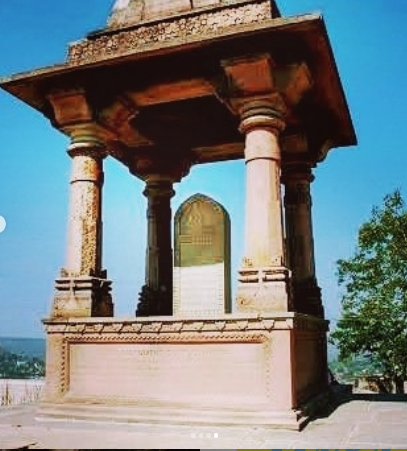 The first thing you see as you make your way towards the fort is a life size statue of Ahilya Holkar holding her beloved God Shiva in Linga form in her hands. There is a temple where all the shiva [lingams] idols she prayed to has been preserved. Inside the fort I spotted a huge space that was dedicated to weavers, women especially and it had been set up the Queen herself decades ago. 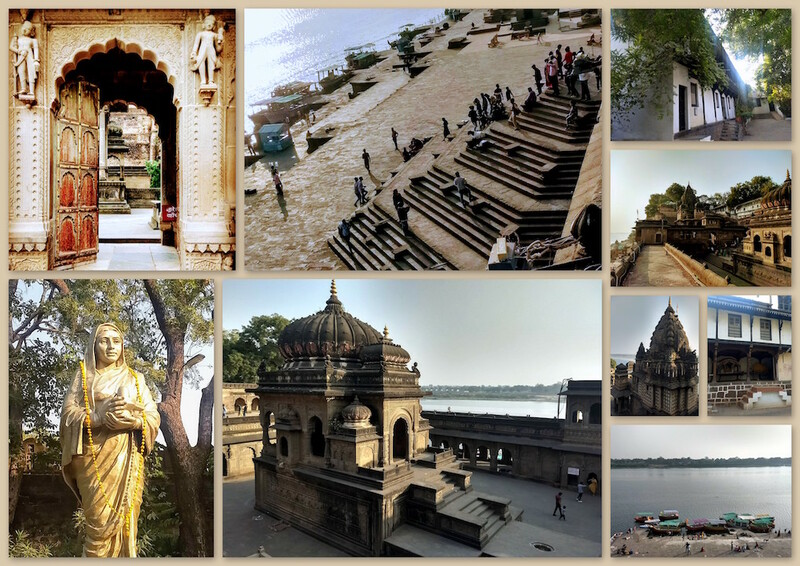 Also located within the fort is the beautiful Akhileshwar Temple, and as you walk down the endless steps, you go all the way to the River. The entire fort and area around is quite breath taking. After spending a few hours here, we were quite exhausted and it was then time to head back to Indore, which was 96 kms away. We got back to our hotel around 7pm and put our feet up, reminiscing about the trip that it had been. 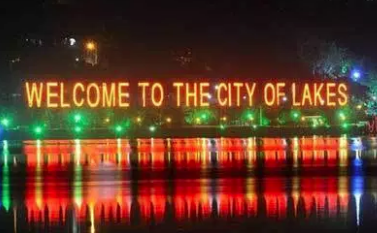 Next day after a brief outing, we decided to chill in Indore and ended up going to mall down the road, catching Aquaman and walking around a bit... Was good to relax and unwind~!! 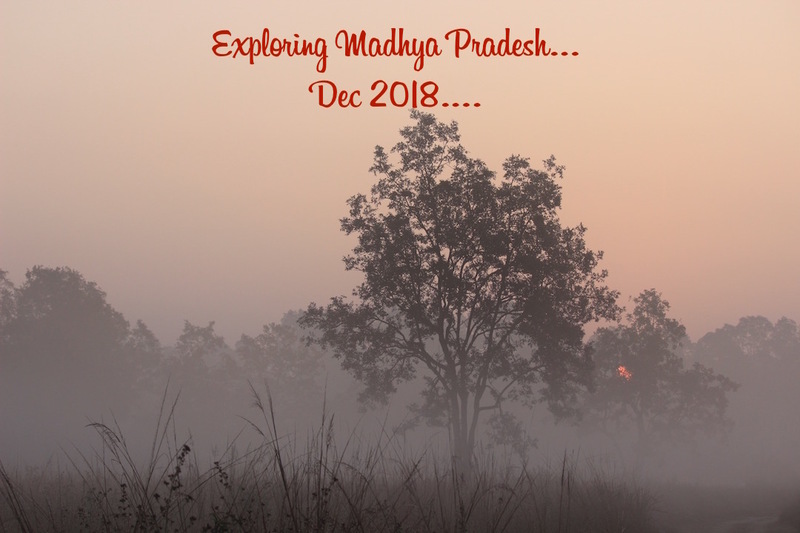 What a trip it had been, and to think it all began with a msg from S in a FB Travel group- "Who wants to come along to Corbett & Panna with us?!" From Chanderi, we took a bus to Lalitpur, just about making it to the 1.45pm train to Bhopal. Upon reaching Bhopal, we headed to Hotel Sangam , which was fairly close to the station. We booked a zoomcar for the next day since we felt it might be cheaper and easier to explore the places we wanted to go to on our own... Also we had read about the buses, most of them dropped off passengers few kms ahead of the places we had in mind. This made sense! Next morning, after breakfast, we got into the car and headed off to make the most of the day. 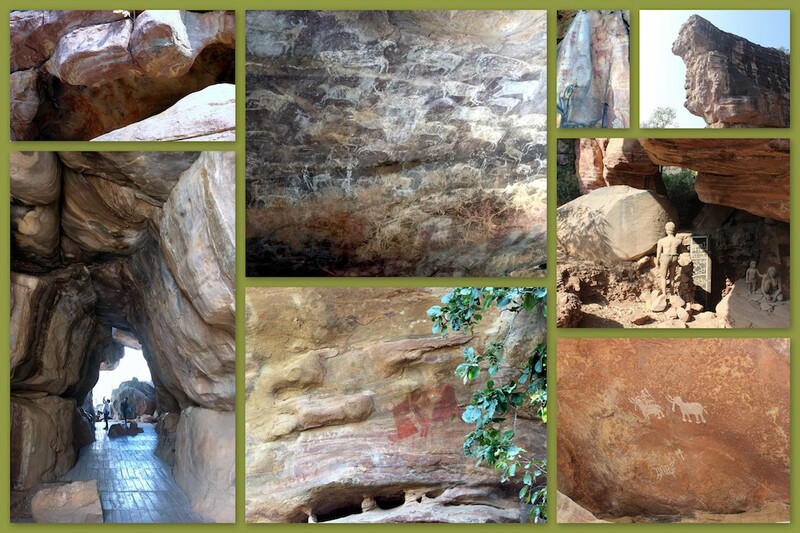 Having seen a few cave paintings, I was quite eager to explore Bhimbetka to see what lies in store here.. Some of the cave paintings here date back to nearly 30,000 years. The Bhimbetka Rock shelters is located at a distance of 45kms from Bhopal. These are know to have been home to humans, over a millennia ago. Located amidst rich flora & fauna, today it is a tourist spot where visitors can walk across the 3km distance and see the various rock structures and cave paintings. A path has been neatly marked to help us navigate the place and there are rocks that have been placed as steps, so it is easy to walk around. 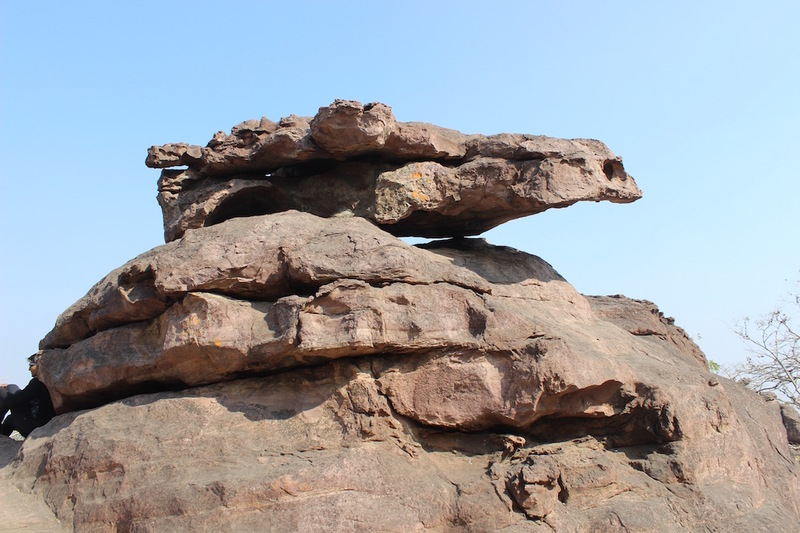 An archaeological marvel, Bhimbetka has around 243 rock shelters of which 15 have been clearly marked out. Some of the paintings depict regular day to day life, while others are on hunting, some are dancing, feature animals & birds as well. Some are white in colour while others are brown, and there are a few overlaps as well. Once you start noticing these paintings, your eyes get trained and you start spotting lot more with ease :) In a few caves you literally have to lie down to see the sketches that are on the ceiling of the rock. Read on one of the sites that the paintings found in the rock shelters here have a striking resemblance to the ones discovered in Kakadu National Park in Australia; to the cave paintings of Bushmen in Kalahari Desert and Upper Palaeolithic Lascaux cave paintings in France. Ideally hire a car or take a cab as the public bus drops you off nearly 3-4kms away and you have to walk. It was fairly hot even in Dec, and quite a walk through nothing but dry land. We gave a ride to two guys who had come by bus, who shared their experience of the tiring walk... You do need to get permit to go inside [it is charged per car and not per person], so buy the ticket near the main road at the office. Also carry water with you when heading inside the cave rock shelters..
From Bhopal, again Bhojpur is about 45kms but since we were headed there from Bhimbetka, it was around 25kms, which took us around 45mins. Bhojpur is renowned for the unfinished Shiva temple- Bjojesvar temple, which is said to house the tallest Shiv ling. Situated along the river Betwa, Bhojpur is said to have earned its name from King Bhoja of the Paramara Dynasty. Why the temple was unfinished is a mystery, but we did see the gigantic structure housing the shiv ling. The architecture is more like a fort than a temple, on the outer walls too there are no indications of it being a temple. Beyond the temple on the mountain plains are markings said to have been made by the architects either for this temple or another one similar to this. As you walk along, you will reach River Betwa... Down the road is a Jain Temple which bears resemblence to this temple in terms of architecture. Rumour has it that it was the same mason for both places. As the sun went down, after a quick visit to Sanchi Stupa [by then my phone & camera battery had died, managed to charge phone wee bit in the car], we decided to wind up for the day and head back to Bhopal, explore the city a bit. We drove around the massive upper lake for a while, looking for parking and then found a spot near the old part of Bhopal which was almost across the road from the lake. Parked the car and walked through the beautiful archway, down a flight of steps, and across the road to the lake. On the lake was the state of Raja Bhoj, who was loved and revered by all. Near his statue is a broken structure that could have been a part of a bigger one. After spending about an hour or so walking around the lake, we headed back to the car. The two of us were talking about how there was so much to see and one lifetime just ain't enough. We had infact reached the last leg of our trip as well, with just Indore left.... Oh well, see as much as you can right!! This was one destination where we did not have too many choices for accommodation- it was either Kila Kothi or Tana Bana, both were MP Tourism properties. The photos and reviews of the former was what helped us decide. Kila Kothi is situated atop the hill, right next to the Chanderi Fort. It had just 4 rooms and the views were magical..Not very expensive, rooms were about Rs2500 per night... The minute we opened the door to our room we were floored, a huge four poster bed and a beautifully decorated space welcomed us in. We got a 360 degree view of the city below from the space beyond the dining area... and could also see the lit up Chanderi fort.. They are currently adding 2 more rooms! the only menace are the monkeys which deter you from sitting outside and having a meal. Next morning, we had breakfast and walked over to the Chanderi Fort. Spent about 2 hours exploring the grounds.. We saw the main courtyard, the rooms within the main building before heading out to explore the rest of the space. As we walked back to the hotel, we crossed a small memorial plaque of sorts. It is the Johar Smarak is an area that is located right outside the fort complex. It is here that women from the Rajput kingdom are believed to have self-immolated in fire (johar) by throwing themselves into Johal Tal after Medini Rai left to fight the battle with the Mughals. There is a stone plaque that depicts this situation inside a canopy towering over Johar Tal. 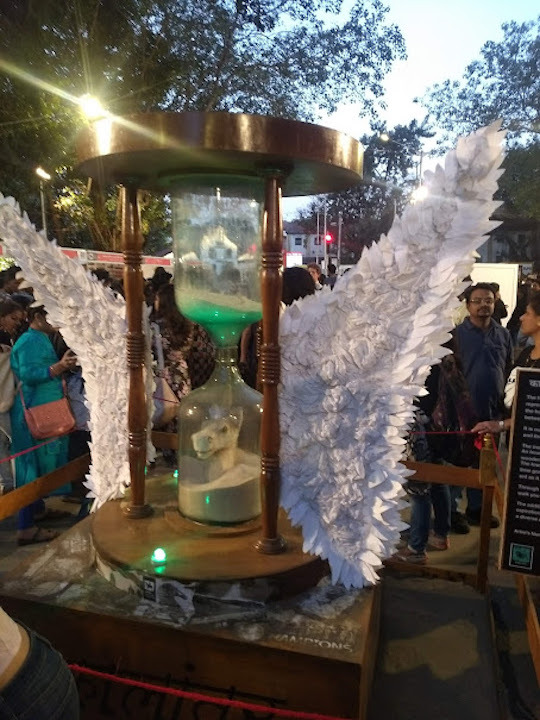 There is a Samadhi near the Johar Smarak. 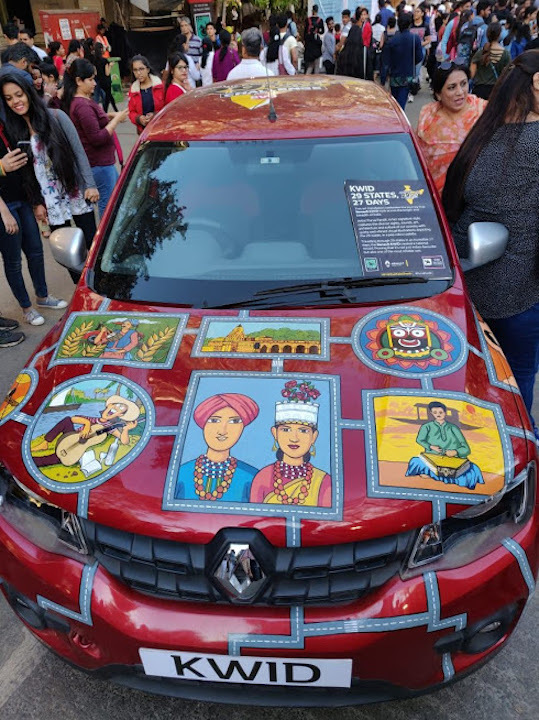 This belongs to Baiju Bawra, a renowned and celebrated musician. Born in Chanderi, he was a student of Swami Haridas of Vrindavan. It is said that he was fascinated by the town of Chanderi and composed a song on it as well. We hopped in an auto we had hired for the day and told him to take us to the Battisi Baoli [ Battisi meaning 32 and this was known to have had 32 ghats for bathing].. By the time we reached the gates it had been quite an adventure, the auto went along an off beat path that was complete wilderness, with not a soul in sight anywhere around. There were no sign boards, no direction, just google maps and the auto guy's local knowledge. Next up we headed uphill towards the Kati Ghati. Infact few days before we landed in Chanderi we watched the movie Stree in our hotel room, and it so happened the climax was shot right here at Kati Ghati. Known to be one of the gates of the Chanderi Fort, this is basically a gateway. 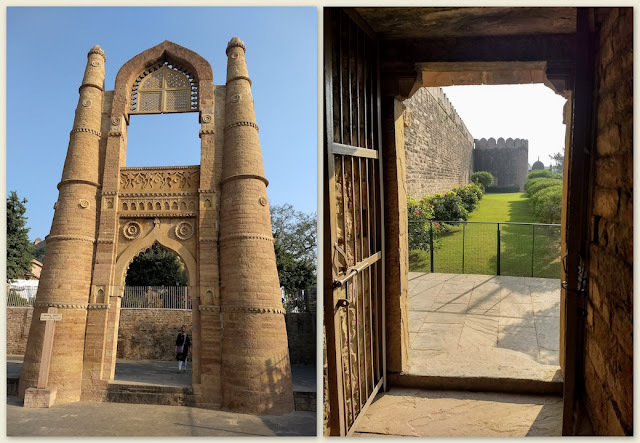 It has been cut entirely out of living rock, is situated on the southern edge of Chanderi.. Sher Khan, son of the then Governor had commissioned this gate to be constructed to welcome the Sultan of Malwa, Ghiyas-ud-din Khilji. Kati Ghati gate is 80 feet high and 39 feet wide. 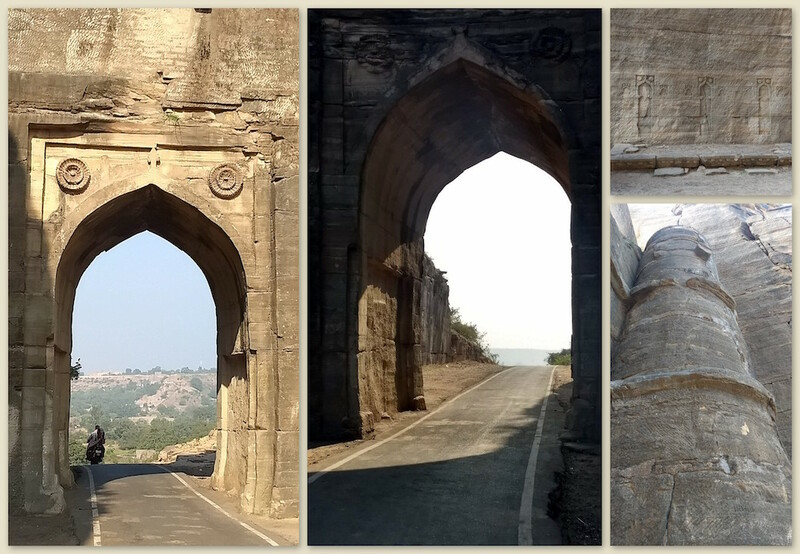 Legend has it that the mason who built this found no hinges to install a gate subsequent to which Sher khan refused to pay him and the mason committed suicide right here... Cut out from a living rock, this is a linking route between Bundelkhand and Malwa. There is a tower like structure on one side with a flight of stairs taking you all the way to the top. This majestic monument was constructed by Sultan of Malwa, originally intended to be a seven storey building, but what we saw had just three complete storeys, nothing but massive halls and arches. Mehmud Shah Khilji constructed this building to memorialise his victory over Sultan Mehmood Sharki in the battle of Kalpi. It is also said that the Sultan constructed this monument in order to provide employment to the people around the area. Open on all sides, the architecture is known to have Greek influences and is quite a sight to see. We saw this structure from the Chanderi Fort and then sometime during the day we made our way to the place. There is a huge fort like wall and a door that opens to beautifully manicured garden. Almost at the end of the place is where the Badal mahal Darwaza stands tall. This gate was constructed by Sultan Mehmood Shah Khilji, the King of Malwa, in the 15th century & built to mark a significant victory. Badal Mahal Darwaza has a height of 100 ft. The structure features elaborate carvings and impressive motifs. The top of the gate features an arched design and two tall minarets stand guard on both sides. 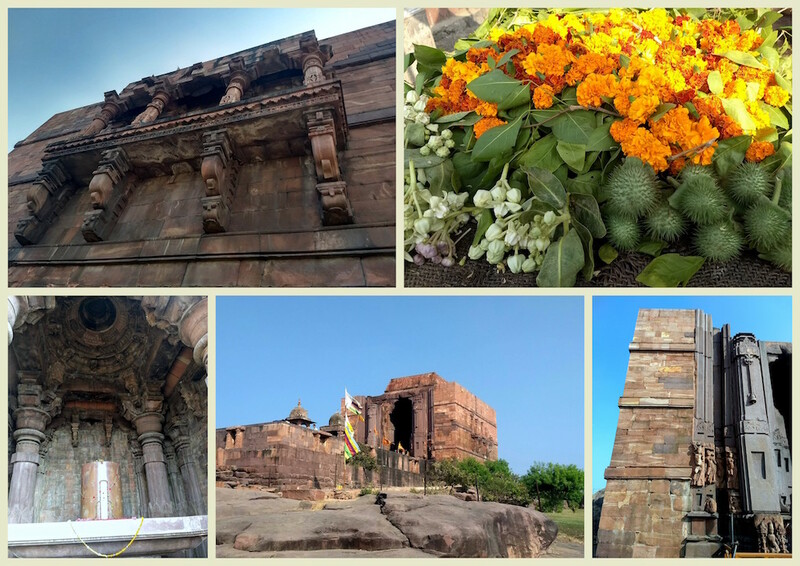 What surprised me was that earlier in 2018 I had been to Odisha, where I went to the Udayagiri & Khandagiri cave temples. Here in Chanderi, I found places with the same name. 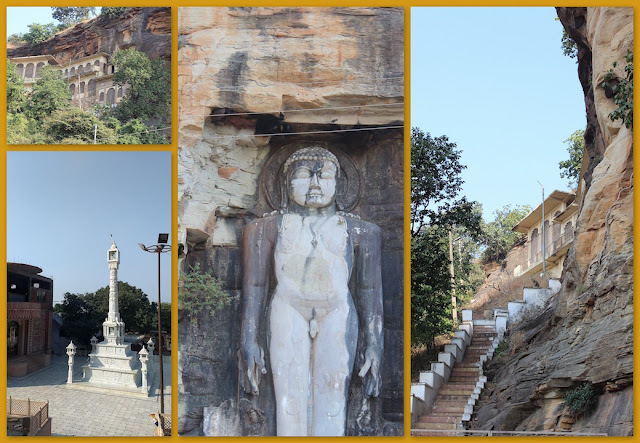 We visited the Khandagiri temple, which is basically etched on a small hill where you will find the larger than life, 45 ft tall statue of the first Jain Tirthankara Rishabha/Adinath as you ascend the long flight of steps. Apart from this, we saw steps leading up the hill with what looked like more inscriptions and statues of other Tirthankaras across both sides of the hill. In total, there are 6 caves on the hill and some of the inscriptions in the caves are indication that the temple is over 700 years old. Monkeys are quite a menace here, deterring us from enjoying the place! As we drove around town, we halted near a semi open gate that led us to another step well. Known to be among the largest among all Bawdis in Chanderi, the Chakla Bawdi is a square stepwell built during the Malwa Khilji rule. 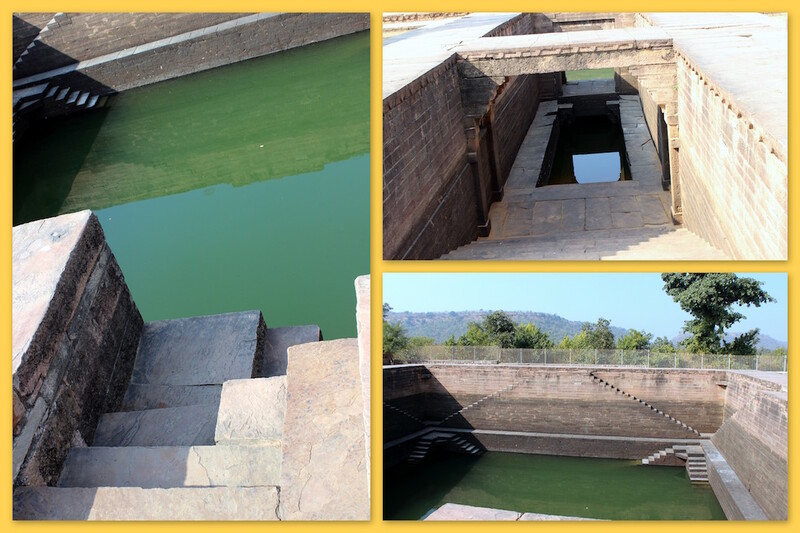 Very different from the other stepwells I hve been to, this one had not one but two tombs on either side - one belongs to Sheikh Raji’s wife while the other has no inscription. It is said that the Bawdi was meant only for the ladies of the royal household and not the common people. These two palaces stand side by side.... Raja Mahal is an imposing seven storey building while Rani Mahal is a two storey structure. Both the buildings are constructed in different styles therefore both would have been constructed in different periods, featuring architecture from around the 15th century. Unfortunately the palaces are in quite a sad state, and we saw quite a bit of repair work going on. 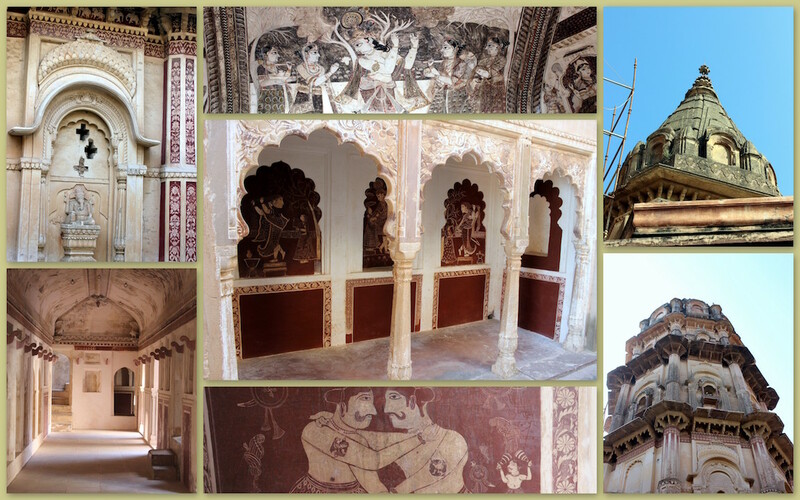 It is said that Chanderi once had nearly 260 palaces, of which only 43 have managed to survive. 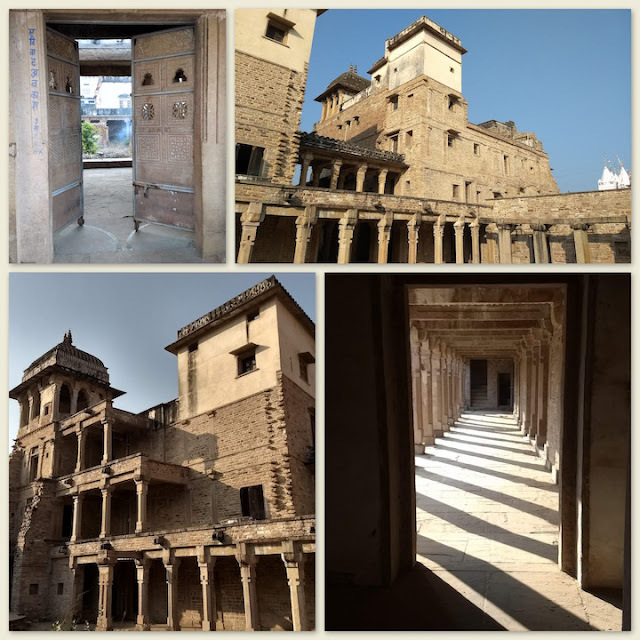 With elegant stairways, a huge courtyard and ornate carvings on the walls, these must have been quite a sight back in the day..
And with that we headed towards the last stop of our trip, meet weavers and maybe do a bit of shopping. The guy who had helped us in the bus was out guide, we met him, he took us to his home and to another weavers' home. They were so hospitable, offering us chai and showing us so many of their creations. Must have spent about 2 hours before we finally made a small purchase and headed back to the hotel to wind down for the evening. This was the view we got from the open balcony behind our room of the city below. It was truly magical and we were glad we had booked a room at this property!! Next morning we packed our bags and drudgingly made our way downhill to find a bus to take us to Lalitpur bus station and onwards to our next destination by train!! From Orchha, we were headed to a town that was a short 18kms away... We were going onwards to Jhansi, a historical city that is regarded as the gateway to Bundelkhand.. 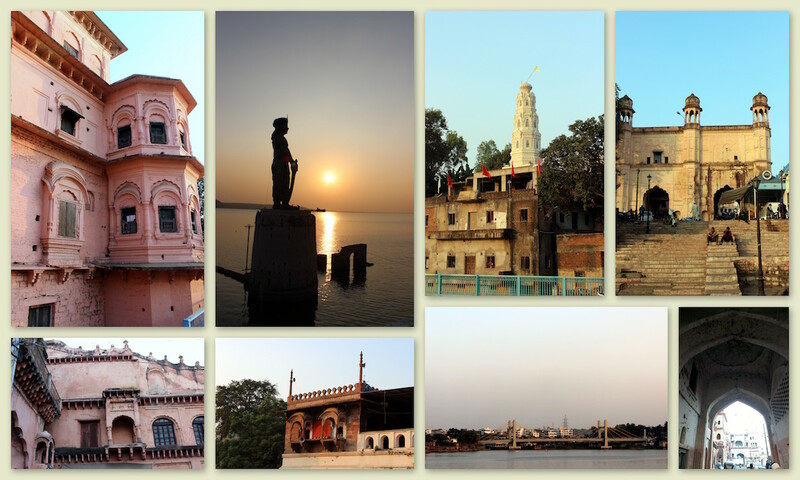 Situated between Betwa and Pahunch Rivers, Jhansi is a small town that was once called Balwant Nagar and was the seat of the Chandela dynasty. Infact, history has it that the region got its name from the fort built by Raja Bir Singh Deo, in 1613 CE. According to legend, the Bundela ruler could see only a shadow (Jhansi) of this fort on a distant hill and thus the fort and the region came to be known as Jhansi. 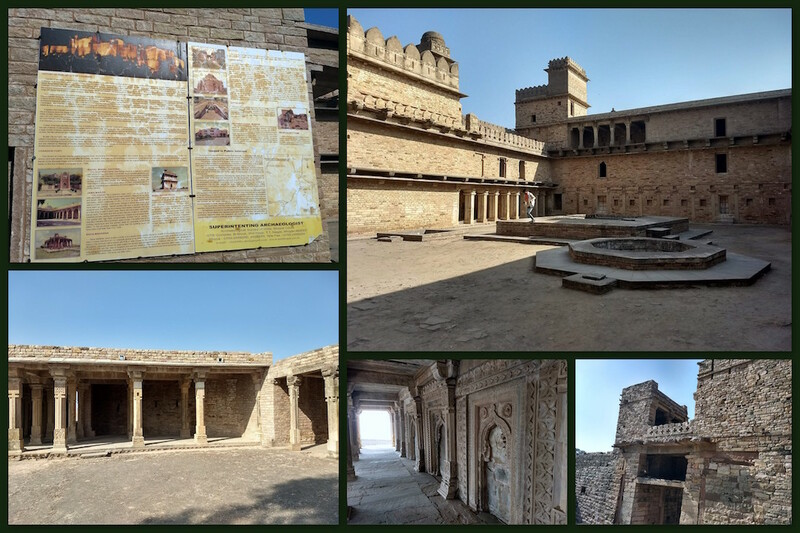 After checking into the hotel, Bundelkand Pride, we decided to start out at the Jhansi Fort. 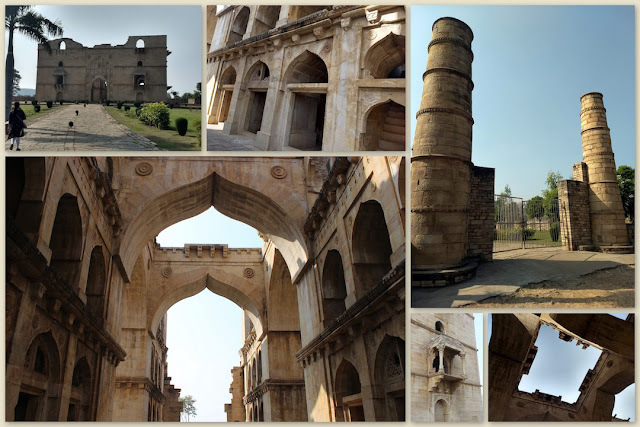 After checking with google maps, we headed out towards the Jhansi Fort, which was less than 2kms from the hotel... Situated atop Bangira hill, Jhansi Fort was built by Raja Bir Singh Deo of Orchha in 1613 CE and served as the base for the Chandela Kings from 11th to 17th century AD. In the 18th century, Jhansi served as the capital of Maratha province and later the Princely State of Jhansi from 1804 to 1853 CE. 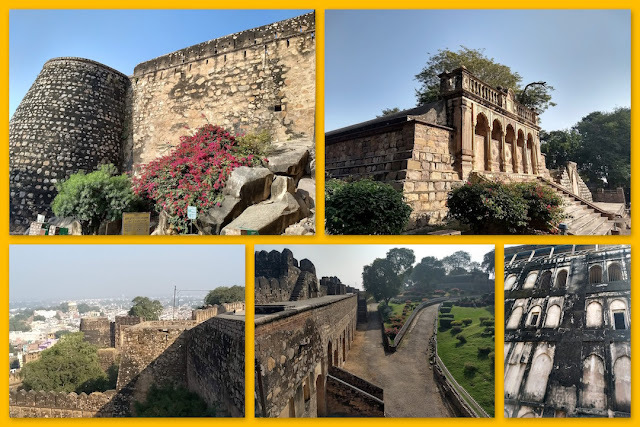 This fort was also the residence of the great Rani Lakshmi Bai of Jhansi, who fought the British East India Company during the 1857 War of Independence. Sprawling over an area of 15 acres, the fort is built in the north Indian style of architecture - granite walls and several bastions with mounted cannons. The wall of the fort had ten gates but many of them have disappeared with time, but some still stand tall across the town.. One of the most popular things within the fort is the Karak Bijli, a lion headed canon measuring 5.5mts by 1.8mts. There is also the Panch Mahal, which was the place where Rani Lakshmi Bai lived with her husband Raja Gangadhar Rao till his death. While walking along the fort wall, you can see a board that is the place where The Jhansi Rani jumped on her horse with her adopted son. St. Jude’s Church is located in the Civil Lines of Jhansi, and having read about the place, I was keen on visiting it. The building is huge and quite different from other Churches I have been to. Along the way, we walked past a few beautiful bungalows, and the church is situated at the end of the street. The devotion to St. Jude Thaddaeus was practically unknown in India, and it was the late Bishop F. X. Fenech who started it in Jhansi, which was a Prefecture Apostolic in those days. 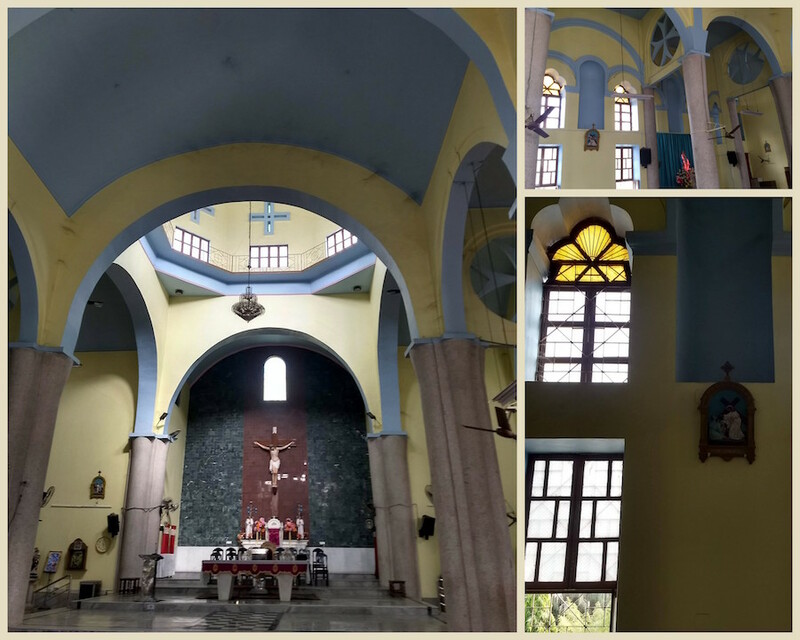 It was not easy to do especially during the World War II, but Bishop Fenech was a man of great faith, he made a promise to St. Jude that if he helped him, he would build a Shrine in Jhansi in his honour. 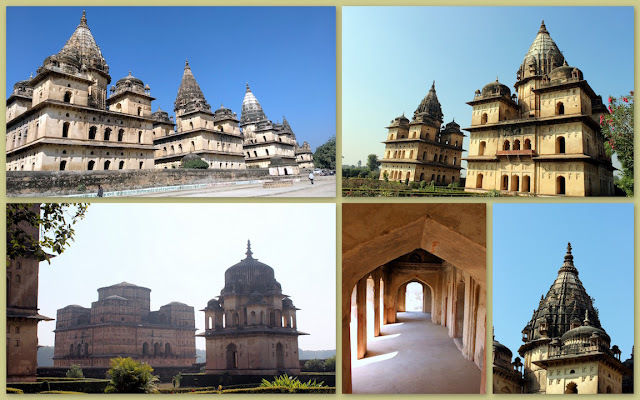 The historic town of Orchha, [the capital of the Bundela Rajput Kings] situated right along the banks of River Betwa, was founded back in the 16th century by Rudra Pratap, the Bundela Rajput Chief. 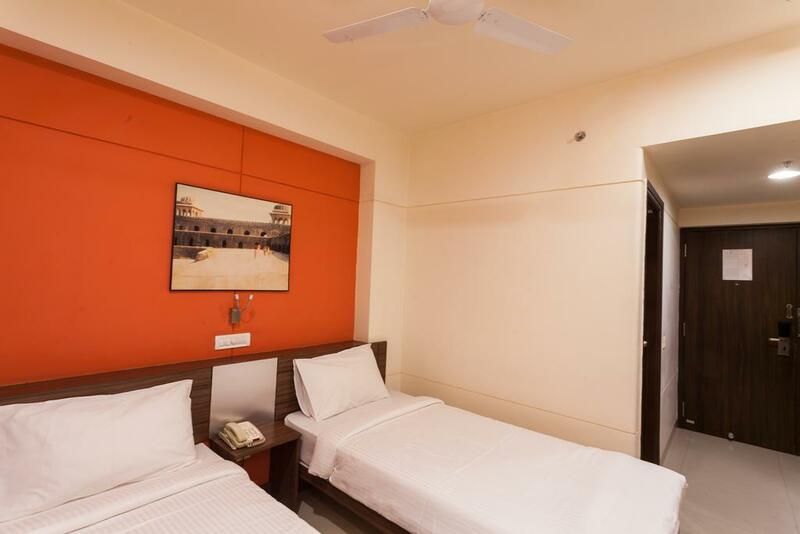 We had booked a tent at Betwa Retreat [it is a Madhya Pradesh Tourism hotel, the place is very good and I highly recommend it], near the river. Since it a small town, most of the sight seeing worthy places are within a kilometers, with the Cenotaphs [ Chatris] just around the corner from the property. The Raja Mahal is a fine example of Mughal architecture with typical stone jali (lattice) work and multifaced arches at the entrance. The palace is in the shape of a perfect square that is further divided into two courtyards. The main courtyard is flanked by the palace which has a four-storeyed building at one end of it. The other three sides have five-storeyed apartments. The Raja Mahal's facade is simplicity personified with hardly any ornamental detailing, but the interiors house some splendid paintings. The outer courtyard has some beautiful arches arranged in floral patterns and carved out in lime mortar. The Diwan-i-Am is an assembly hall where the king often held meetings with his council of ministers. The hall has three platforms, and from the highest one, the king held forth on affairs of the state. The Diwan-i-Am has massive columns and the ceiling has been decorated with paintings belonging to the Mughal and the Bundela schools of art. The exterior of the palace is decorated with elephant and lotus-shaped brackets. The entire architecture of the Raja Mahal is exquisite and speaks loftily of the stone carvers who sculpted it. Also inside the same complex is the Jahangir Mahal..This property was built to honor Jahanghir on his first visit to Orchha. Similar to the Raja Mahal, the fort consists of some breath taking sculptures, hanging balconies, delicate trellis and chhatris, topped domes, etc. Built in 17th century by Bundela ruler, Bir Singh Deo, this palace is the symbol of friendship between the Bir Singh Deo and Jahangir. 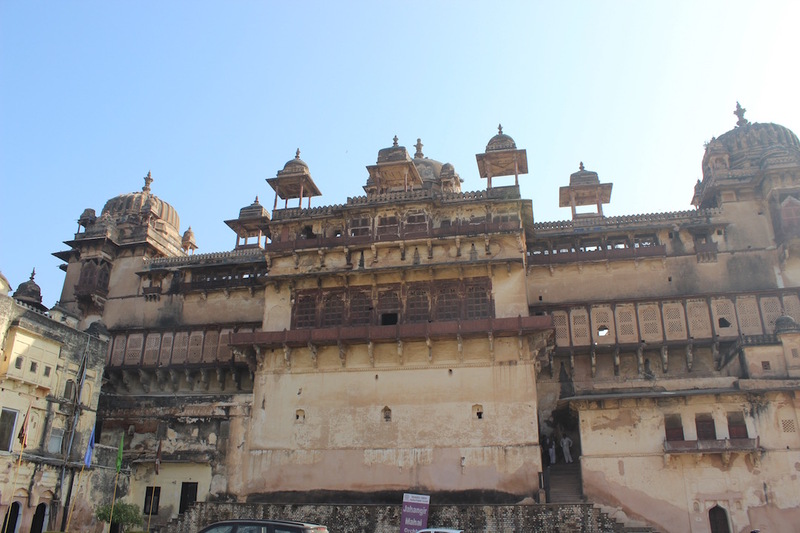 During the first visit of Jahangir in Orchha, this palace was built in his honor. Right next to it is a smaller building which has a room that used to be the Maharaja's bedroom. 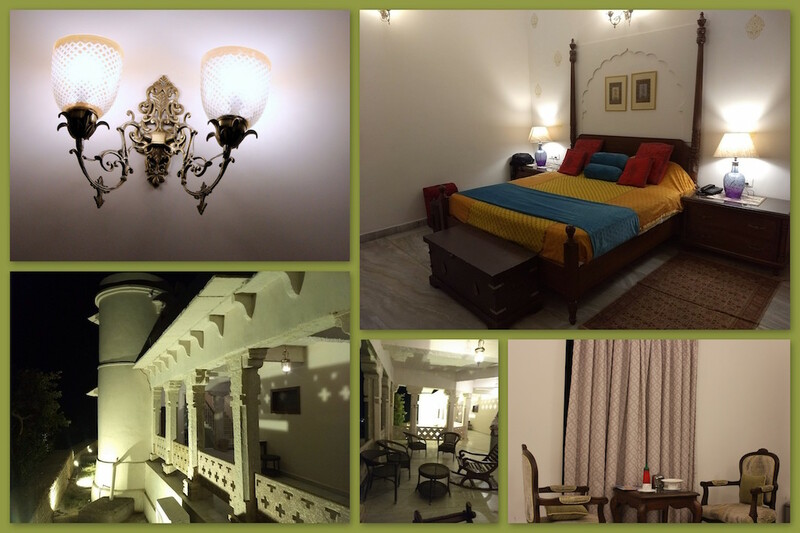 Today it is Hotel Sheesh Mahal, a hotel that also belongs to the same group that owns Betwa Retreat with Sound & light shows in the evening.. Located atop a hill, near the Raja Mahal, the Lakshmi temple is very different from any other temple you would have visited. There was a guard at the entrance who told us that the main idol had been stolen few years back and some renovation was going on, so we had to be careful walking around the place. 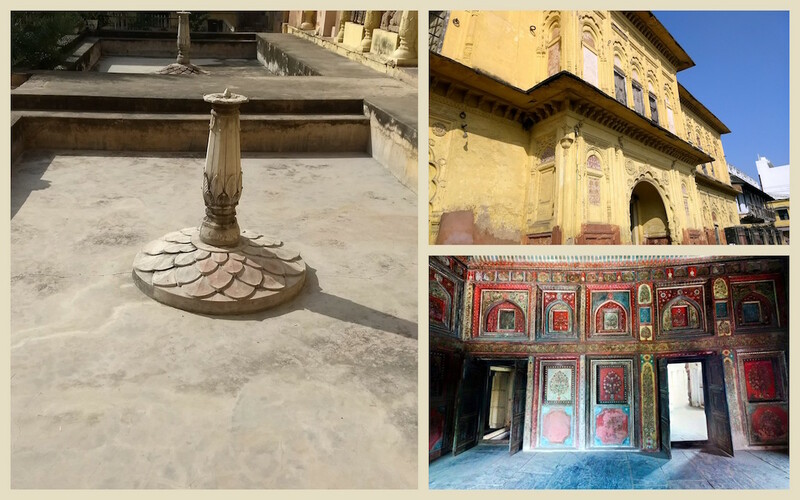 The place is a mix of Hindu & Islamic style of architecture, with long rooms on all 4 sides that are filled with interesting paintings on the walls and ceilings [these are called "Sgraffito",a kind of art work]. Apart from the vibrant canvas, there are these scratch paintings, which form a different section of art in the temple...the walls are painted brown with the design scratched off the walls.. There is also a tall tower of sorts along with a small tomb. These were my first glimpse into Orchha, featured in a Maaza ad. 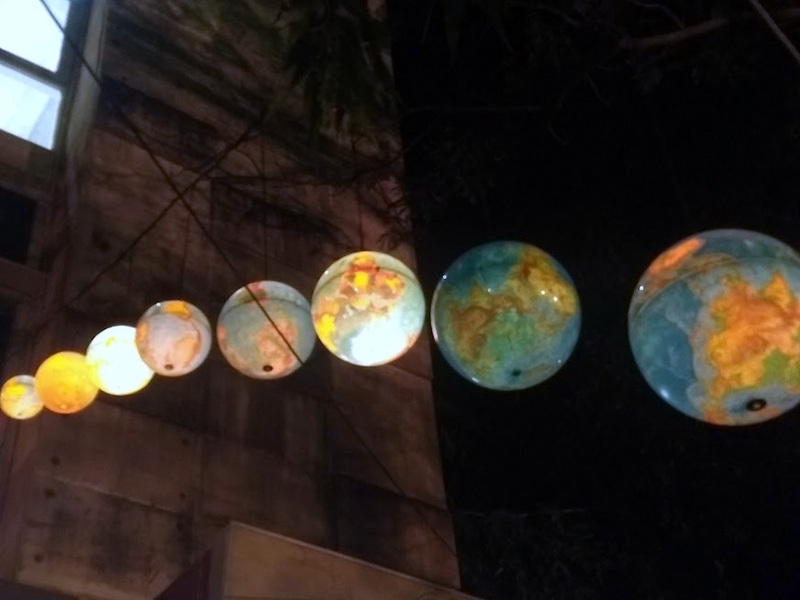 Instead of being captivated by Katrina kaif, I couldnt stop looking at these that were the backdrop. 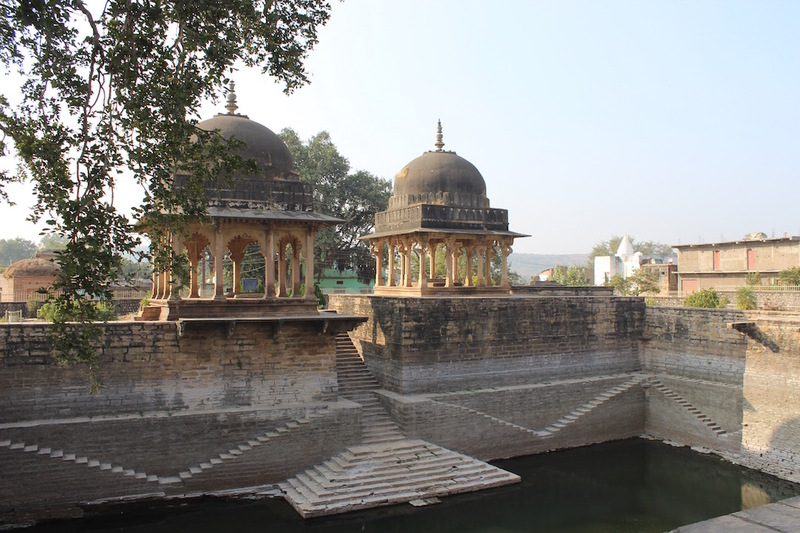 The cluster of the Chhatris along the Kanchana Ghat of the Betwa River are structures that will have you curious and excited. 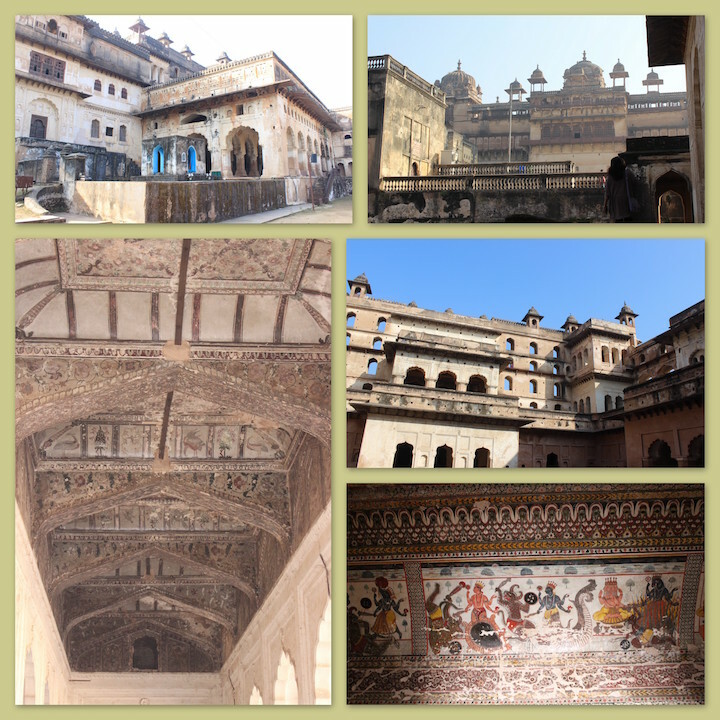 They are memorials of the rulers of Orchha [going back to the 17th and 18th century]...There are about 14 cenotaphs inside one complex with structures similar to each other, some bigger and others with far more detailed intricate work on them. The one that stood out was Bir Singh's Cenotaph - it features Islamic style of architecture as well.. Today these cenotaphs are also home to the endangered Indian Vulture specie... We spotted quite a few, some sitting inside the mini structures and others on the spires and the walls around the place. What is interesting is that we bought an entrance ticket of Rs10 per person of Indian origin [Rs250 for foreign visitors] at Raja Mahal and this ticket was valid across Raja mahal, Jahangir Mahal and Lakshmi temple as well. We we walked back to our hotel, the only thought on my mind was "damn, the past was packed with all kinds of adventures, wonder what it must have been like to live in that era...." well, it was time to pack our bags and head over to the next destination... Any guesses where?